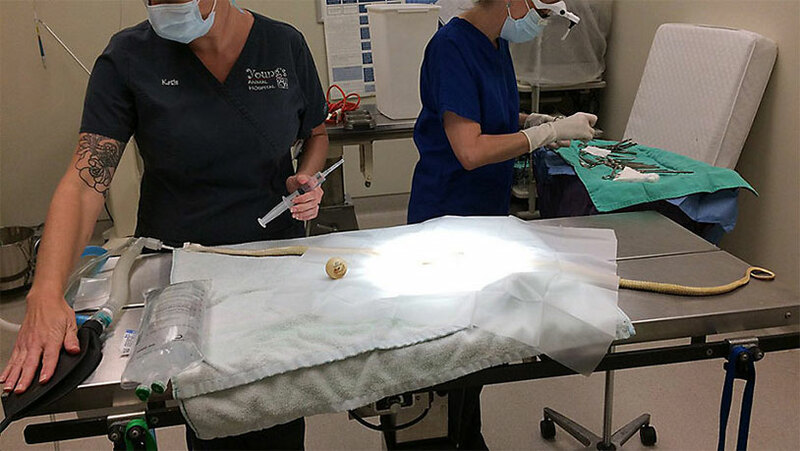 Snake owners know that ping pong balls are poison to their pets – they look way too much like eggs, one of a snake’s favorite foods, but once they go down the gullet they’re virtually impossible for the animal to spit out or break down. A vet in Orlando knows this all too well, as he saved a snake’s life recently from just such a predicament. A Rockledge resident called Wild Florida Rescue after finding a 2-foot-long rat snake acting oddly. The person noticed that the snake was unable to move properly and had a sizable swelling in its midsection. Dr. Angela Bockelman was on duty at the animal hospital and opted to take an X-ray to see what was going on. Inside the snake was, yes, a ping-pong ball. The enterprising vet sedated the beast and performed a rapid surgery, and within 20 minutes the critter was free of its mistaken meal. It’s expected to make a full recovery, and hopefully will be a little more cautious about the food it swallows in the future once it’s released to the wild.